The Pigeon River acts as the international border between the United States and Canada. It is here that U.S. Highway 61 ends only to become Canada’s King’s Highway 61, stretching to its final destination, Thunder Bay, Ontario. The city of Thunder Bay was created in 1970 (the bay itself had been there for quite some time) when the towns of Fort William and Port Arthur merged. Fort William was once the hub of the Canadian fur trade, formed in 1803 by the Northwest Company. Port Arthur grew out of Prince Arthur’s Landing and incorporated in 1884. Each spring passenger pigeons would arrive near a Lake Superior tributary to breed; the local Ojibwe would use large nets to snare the birds, which they called Omimi, and so they named the river Omimizibi after the birds. The passenger pigeon went extinct by 1900, but the Pigeon River continues to flow. Outside of the St. Louis River, the Pigeon is the largest river feeding Lake Superior and acts as a border between the United States and Canada. 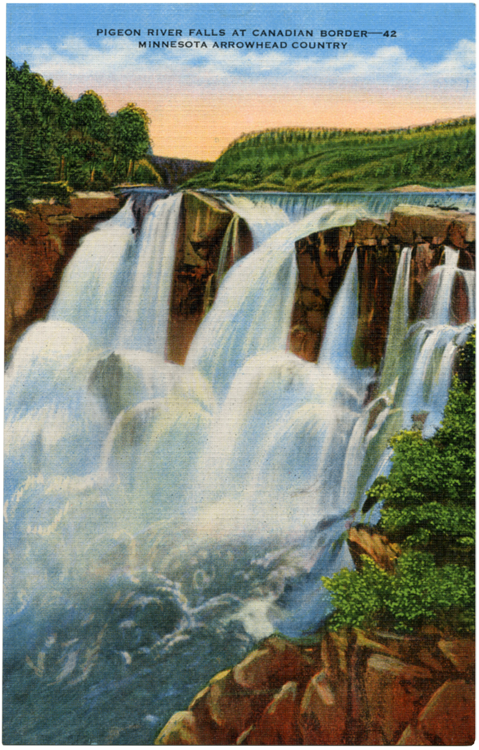 Two miles from its mouth, Middle Falls drops the river 70 feet; upstream the highest waterfall in Minnesota, High Falls, cascades 120 feet.